Various HPWREN related cameras captured images during the Cedar Fire, and to a lesser degree the Paradise Fire, in the San Diego area in late October, 2003. This resulted in about 150,000 still images, many of which were turned into DVD-quality MPEG2 time lapse animations. If you have difficulty displaying the MPEG2 animations, please refer to the note at the bottom of this web page. Frame-by-frame original digital images, usually at much higher quality than shown in the animations, were retained. The animations generally have time stamps in them, but they are in the corners and may not be visible if played back on a TV. In some NTSC video camera iserver originating animations the time may be off for an hour, when an Axis camera server did not execute the switch from Daylight Savings Time during the night (the Mt. Woodson and Mt. Laguna Observatory camera servers were affected by this). This Mt. Woodson animation is from 704x480 pixel interlaced images of a pan/tilt/zoomable video camera that is remotely controlled. Most of the first night is shown, starting at 2140 on the 25 October 2003 to 0442 on the 26 October 2003. Note that the Daylight Savings Time adjustment did not happen in this animation. The animations starts by pointing approximately east from the Mt. Woodson based camera, until a CDF fire captain of the CDF Ramona Air Attack Base remotely re-pointed it into a more of a south-east direction. This Mt. Woodson animation is from 704x480 pixel interlaced images of a pan/tilt/zoomable video camera that is remotely controlled. The animation starts around 0442 on the 26 October 2003 and ends at about 1247 on the 26 October 2003 as a result of a power loss in the west Ramona area. Some of the daytime imagery is of the Paradise fire. The frame rate is about one every ten seconds. NOTE: The time stamps in the animation is off by an hour until 09:32:22 when the Axis camera server finally realized that Daylight Savings Time is over. The animation from a west-pointing camera on Mt. Laguna is downsampled from >3000 progressive-scan images of 1288x968 pixels of a fixed IQeye3 digital still network camera. The frame rate is about one every twelve seconds. The animation is from 28 October 2003, and shows the plume building up over the Cuyamacas and heading towards Mt. Laguna, starting around 0635 and ending around 1720. Note that the highest mountain in the background is Cuyamaca Peak at a slightly more that 6500 feet and a distance of a little more than 11 miles from the camera. 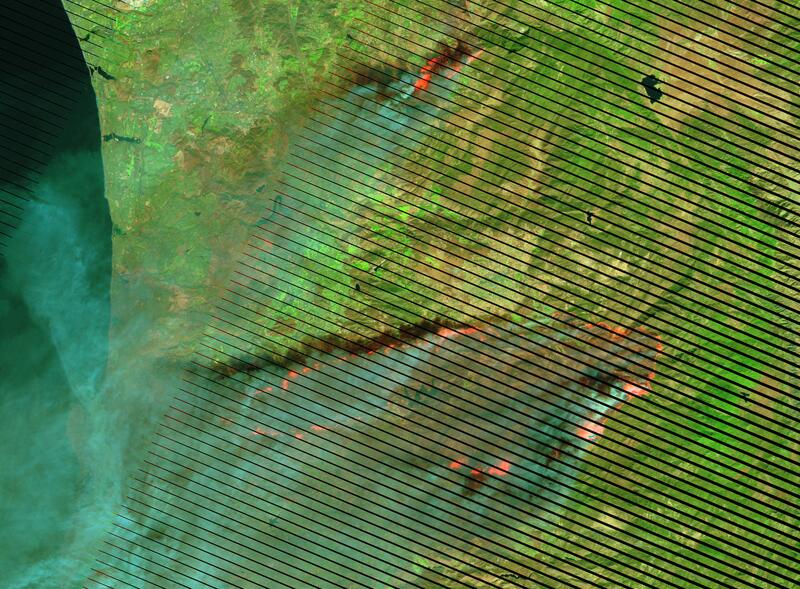 A 19 November 2003 Landsat 5 image, provided by the USGS, illustrates recent burn areas. A stitched-together 360 degree view from the 28 October 2003 shows the fire approaching at 15:00 and 15:10, as seen from Mt. Laguna. I.e., the two sets are ten minutes apart. A full resolution 17+MB TIFF version as well as a low resolution 15:00 , 15:05 , 15:10 , 15:15 , and 15:20 QTVR versions are also available. 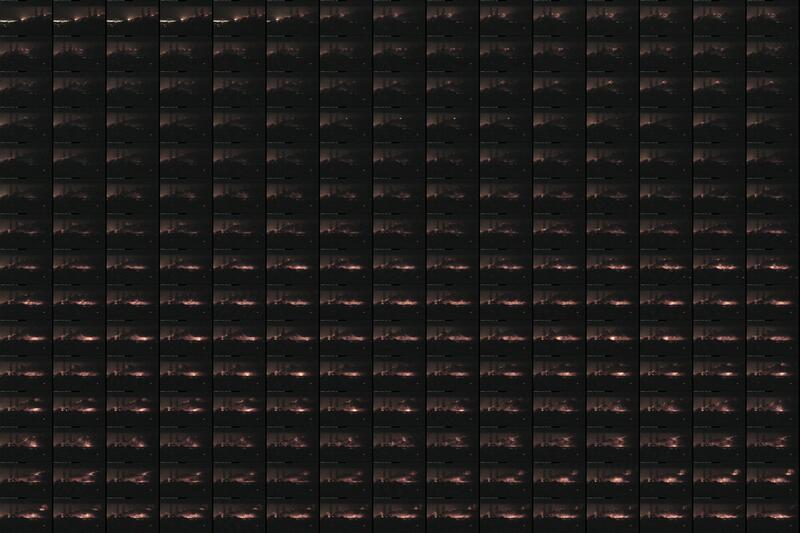 The collated images are a result of four IQeye3 cameras creating progressive-scan images of 1288x968 pixels. wrmn-20031026.mpg (151.9MB) from west Ramona on the 26 October 2003 is downsampled from progressive-scan images of 1288x968 pixels of a tripod-mounted IQeye3 digital still network camera pointing east, and briefly south towards the end of the animation. The frame rate is about one every twelve seconds, but displayed three times per frame. MW-20031026_021741-025601.jpg is a 225 image "film strip" time series, about 7.4 megabytes in size, from Mt. Woodson on 26 October 2003, between 02:17:41 and 02:56:01. It starts right when a CDF fire captain remotely changed the camera azimuth from pointing about east to a more south-easterly view. The gap between the images is about 10 seconds. The image expands to about 233 megabytes during JPEG decompression. The image size is 10800x7200 pixels, appropriate for 36" times 24" prints at 300dpi. Note that the time stamps in the images are off by an hour, due to the camera server missing the switch from Daylight Savings Time. L7 includes a clickable Landsat7 map of the southern California fires from 26 October 2003, provided by the USGS. The original single full TIFF image size was about 1.6 gigabytes. calif_merge_albersm-cp.jpg is a full scale excerpt of the San Diego area. MLObservatory_20031025.mpg (85.9MB) and MLObservatory_20031026.mpg (74.2MB) are animations from a pan/tilt/zoomable HPWREN camera located at SDSU's Mt. Laguna Observatory It starts at Saturday, 25 October 2003, at 2347, to 1304 on Sunday, 26 October 2003. During Sunday the timestamp is off by an hour since the Axis camera server did not switch out of Daylight Savings Time. The frame rate is one about every ten seconds. This animation is is at 704x480 pixel resolution of interlaced images from an NTSC camera. The MtLaguna-West_20031029.mpg (109.8MB) Mt. Laguna animation is downsampled from progressive-scan images of 1288x968 pixels of a fixed IQeye3 digital still network camera pointing West. The frame rate is about one every twelve seconds. The animation is from 29 October 2003, and shows a waterfall (smokefall) into the Anza Borrego Desert. The MtLaguna-North_20031029.mpg (104MB) Mt. Laguna animation is downsampled from progressive-scan images of 1288x968 pixels of a fixed IQeye3 digital still network camera pointing North. The frame rate is about one every twelve seconds. The animation is from 29 October 2003, and shows a waterfall (smokefall) into the Anza Borrego Desert. np-20031026.mpg (73.2MB) is from a pan/tilt/zoomable HPWREN camera located at a private house on North Peak from Sunday, 26 October 2003 from 0542-1305. That house (and camera/etc.) burned during the incident, but long after the animation stops. The animation stops around the time when power was lost in the Ramona area, as that is where the images were collected. This animation is is at 704x480 pixel resolution of interlaced images from an NTSC camera. The frame rate is about one every twelve seconds. Some full resolution still images of the CDF Ramona Air Attack Base from the early morning of 26 October 2003 were added. http://hpwren.ucsd.edu/Photos/20031026/ has some more images that were taken with a handheld digital camera, also from early morning, 26 October 2003.
cdfrmnaab-20031026.mpg (99.6MB) is from an HPWREN camera located at the Ramona CDF Air Attack Base. The images are from Sunday, 26 October 2003. The animation is downsampled from progressive-scan frame images of 1288x968 pixels of the fixed IQeye3 digital still network camera. The frame rate is about one every twelve seconds. The animation shows every frame three times, for 10 fps. The animation starts at about 06:15, about 15 minutes after the Air Attack OV-10 took off for the Cedar fire. Multiple S-2 tankers have also already left and are in the air by the time the animation starts. The animation shows a CDF helicopter taking off during the animation. The animation stops when power was lost for a few hours at the HPWREN backbone site on Mt. Woodson. The animations are MPEG2 video-only (no audio track) in a DVD compatible format. With a DVD writer and authoring software, they can be written onto DVD and played back on a TV with a DVD player. It is best to download an animation in its entirety, then play locally. WinDVD or any other DVD player application such as PowerDVD. I could not play it until I installed WinDVD to get the codec. In Unix, mplayer is able to decode the MPEG2 files. HPWREN is a multi-institutional and interdisciplinary project, led by University of California San Diego researchers at the San Diego Supercomputer Center and the Scripps Institution of Oceanography. The HPWREN project is based on work sponsored by a research grant of the National Science Foundation and its CISE/ANIR division under Grant Number ANI-0087344. If you use HPWREN data from this data set, you must give a credit reference to the National Science Foundation Grant Number ANI-0087344, and the University of California, San Diego. HPWREN acknowledges significant collaboration of the San Diego Sheriff's Department, the California Department of Forestry and Fire Protection, and the San Diego State University, among others. Any opinions, findings and conclusions, or recommendations expressed here are those of the authors/researchers and do not necessarily reflect the views of the National Science Foundation or other affiliated collaborating entities.